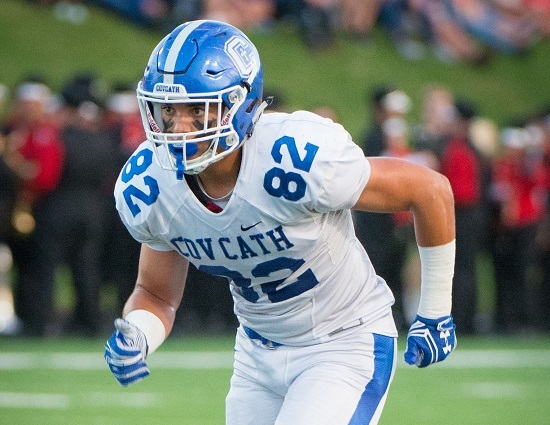 Quietly, Covington Catholic senior Kam Butler put together one of the most decorated careers in Colonels football history. The senior added to his hardware by being named the 2017 TriStateFootball.com Kentucky Defensive Player of the Year as TSF paid tribute to the finest from Cincinnati, Northern Kentucky, Dayton and Southeast Indiana at its Year in Review Show on Monday night at the Holy Grail – Banks, downtown Cincinnati. He wreaked havoc for a Colonels defense that allowed just 7.7 points per game on the way to a perfect 15-0 record and the program’s seventh state championship. The versatile Butler become the first player to ever be named First Team All-TSF on offense as a tight end in ’16 and on defense as a linebacker this past season. He ends his career with more than 230 career tackles, seven interceptions, 20-plus sacks and on offense he hauled in 22 receptions, 373 yards receiving and five touchdowns. Butler will attend Miami (OH) along with teammate AJ Mayer. Other finalists included three seniors – Grant Dyer (Covington Catholic), Nelson Perrin (Scott), Brayden Trattles along with juniors Adam Derry (Beechwood), Jackson Saladin (Ryle) and sophomore Michael Mayer (Covington Catholic).